Welcome to Blue Nile Farm! In 1995, it all started with the purchase of 32 acres of fallow overgrown wooded land containing no structures in Geneva Township. The farm now has an enjoyable picturesque setting of planted pastures broken up with white flex fence, three ponds, and acres of woods which we have used for trail riding. Where are we? The property is between Geneva and Saybrook Township, approximately 1.5 miles from Lake Erie. The property was selected based on its proximity to most major cities of Ashtabula County and within 7 miles of the Lake County line. Furthermore, we are approximately 10 minutes from Rt. 90 at either the Rt. 45 or Rt. 534 ramps. 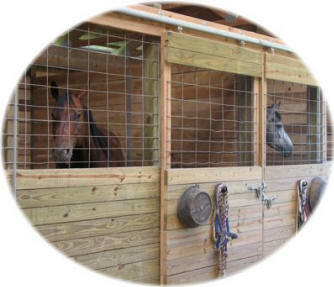 By 2005, the farm had been developed into a 21 stall horse facility designed to serve the boarding needs of the general public catering to multi disciplines and any breed. The main horse barn has natural light completely down the center isle providing great visibility for both horse and owners. The indoor arena is connected to the main barn with a walkway between both barns. The indoor arena is a Cover-All building which is loaded with natural light during the day and exceptional lighting in the evening. While a lot of people ask about the amenities and services, just as many ask about the name. Blue Nile is actually a brand of diamond. Since the farm has evolved into a “gem”, it was named as such. More improvements are planned for the future to make your riding and boarding experience more pleasurable. So please feel free to browse the site and contact the farm with any questions that you may have. Come visit us soon. You will like what you will see! © Copyright 2008-2018 Blue Nile Farm, LLC. All rights reserved.